The Pioneer program is for our 14-15 year old campers. Young people in this age group experience safe river travel. They might explore the Dumoine, Temagami, Sturgeon, Noire and Makobe. They learn river-reading skills for navigating moving water and are introduced to river rescues. These trips are extraordinary experiences ranging from 9 to 20 days depending on the session. 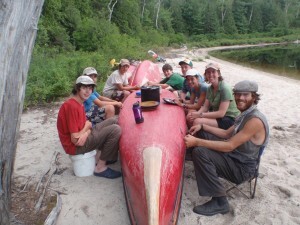 Not only do these trips prepare campers for our longer expeditions, they provide a solid foundation for a lifetime of wilderness canoe tripping. Schedule and pricing for the Pioneers program.